Whirlpool's Cabrio clothes dryers come equipped with features like automatic moisture sensing and steam-enhance cycles designed to make doing your laundry easier. Available in both electric and gas models, Cabrio dryers come with one-year limited warranties that cover defects in the materials or workmanship that exist upon purchase and that may require a service call. You may occasionally encounter issues that prevent your dryer from operating properly, such as failure to start or an error code, that you can resolve yourself so you can get it back in working order as quickly as possible. If your dryer won't start, check the power supply. Examine your home's circuit breaker or fuse box to make sure you don't need to reset the breaker or change a fuse. Keep in mind that your dryer may require two circuit breakers or fuses. Whirlpool's electric dryers require a 240-volt power supply, so if you've just installed the dryer, check with a qualified electrician to make sure enough power is available for the appliance. If your dryer has adequate power, ensure that its door is closed completely; the appliance will not start if the door is ajar. The dryer may also fail to start if you don't hold the Start/Pause button long enough -- hold the button for two to five seconds or until after you hear the dryer drum moving. If your dryer doesn't heat, it may not have sufficient power. Because it may require two fuses or circuit breakers, the drum may turn but no heat will produce. Check your circuit breaker or fuse box and reset both circuits or replace fuses as necessary. Ensure that your dryer is hooked up to a 240-volt power supply by consulting a qualified electrician. If you have a gas dryer, make sure the gas supply valve is open. If you find that your clothes are partially damp at the end of a cycle or that drying times are longer than you're used to, your lint screen may need cleaning. Prior to each load, remove the screen from its slot just inside the front of the drum and remove any debris that may be clogging it. Drying can take longer if the exhaust vent isn't the proper length and diameter. Consult your owner's manual to determine the proper size for your particular Cabrio model. If your dryer is in a closet, it may not have proper ventilation to ensure effective performance. There must be at least 1 inch of free space in the front of the dryer and 5 inches of space at the back. 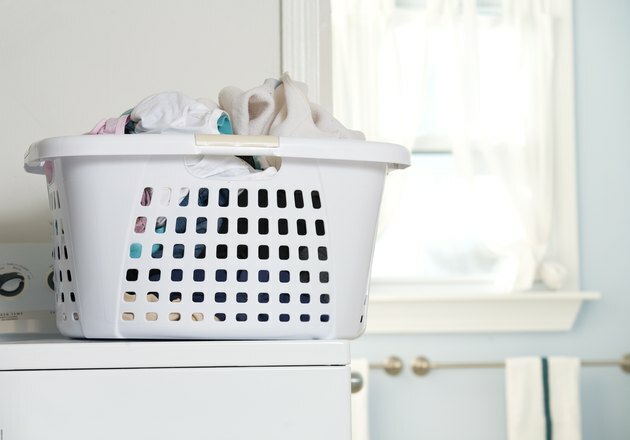 Your dryer may provide poor drying results if you place a load that's too large or heavy inside. Remove some of the load to ensure that all of the pieces can tumble freely. Your Whirlpool Cabrio dryer may occasionally display error codes that identify specific issues with the appliance. If you see the "PF" code, it indicates that a power failure has interrupted a drying cycle. Restart the dryer by pressing the Start/Pause button. When your dryer displays an L2 diagnostic code, an issue may exist with its power supply, like low or no line voltage to the appliance. The dryer will continue to run even when the code appears; press any key on the control pad to clear the display. However, you should check your home's fuse box or circuit breaker to see if you need to replace fuses or reset the circuit breaker. Examine the power cord as well to see if it is properly installed according to your Cabrio model's installation instructions. If the code continues to appear, have a qualified electrician examine the dryer. If you see F# E# code, such as F1 E1 or F2 E1, your dryer requires service. Call the number in your owner's manual for assistance.